Aore Resort is located on 10 acres and is an absolute beachfront resort that backs onto a cattle/coconut Plantation. The accommodation consists of 10 Double/Twin Bungalows and 8 Family bungalows. The bungalows have private bathrooms, ceiling fans, refrigerators, tea and coffee-making facilities and large balconies. Aquana Beach Resort is a new and modern family-friendly resort located only 15 minutes from Port Vila but offering a secluded and quiet atmosphere. The sixteen 1 and 2 bedroom Bungalows are light and airy and perfect for families and couples. This Vanuatu accommodation has a variety of facilities such as a restaurant and bar, child minding, swimming pool and a tour desk. 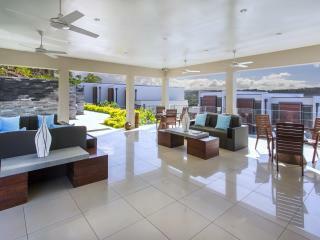 Located on 23 acres, at picturesque Mele Bay in Port Vila. 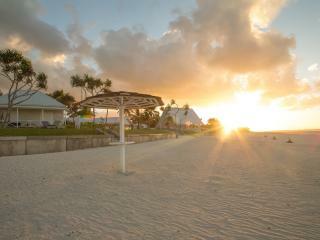 Benjor Beach Club is close to the town's centre as well as the luxury of being away from it all. The resort offers a choice of either one bedroom units or five bedroom self contained villas, suitable for up to 8 people. The facilities at Benjor Beach Club include a swimming pool, tennis courts, wedding chapel, mini golf and a restaurant. Out on the frontier of the Pacific exists the original coral eco island "Bokissa" in an atmosphere that's a little wild... and seriously private. Presently there is only a maximum 37 guests on the island at any one time. 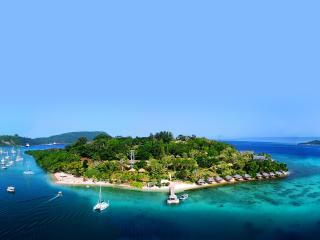 Bokissa Private Island Resort is the ideal private getaway for couples and families. Enjoy your holiday at this unique boutique resort on the magnificent surf beach at Pango. Nestled amongst beautifully landscaped grounds, the exclusive Breakas Beach Resort guarantees to rejuvenate, pamper and indulge every guest. Relax at the Infinity Pool Bar while sipping a South Pacific Cocktail. An elegant and cosmopolitan resort, Breakas Beach Resort offer 63 Bungalows situated on a sweeping, white sandy beach, fringed with palms. Chantilly's On The Bay offers self contained accommodation just 5 kilometres from the airport and 5 minutes walk to the centre of Port Vila. All apartments are air conditioned and have individual decks with fabulous views over Fatumaru Bay. Enjoy romantic harbourside dining at Tilly's Restaurant with its amazing full wall aquarium, or simply relax by the saltwater swimming pool. A variety of watersports are also available and the shops are just minutes away. 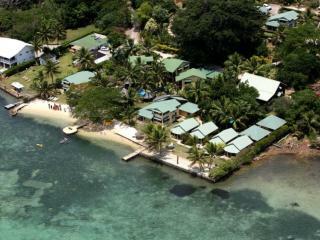 Coconut Palms Resort is centrally located just 10 minutes stroll to the centre of Port Vila. 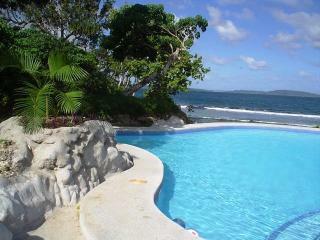 This resort offers comfortable Vanuatu accommodation from budget guest rooms to comfortable self contained apartments. Relax by the pool, sip a cocktail at sunset, play a game of pool in the bar or enjoy a fantastic meal in the restaurant. 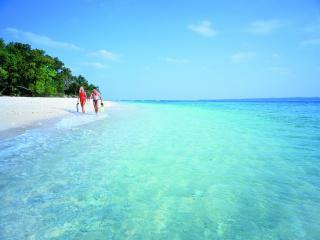 Erakor Island Resort and Spa is surrounded by white sandy beach and crystal clear waters of Erakor Lagoon. Guests can enjoy a relaxing getaway at the 16 acre tropical island which is linked to the mainland by a free 24 hour ferry. 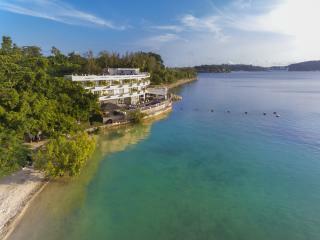 Just 5 minutes from Port Vila, the resort offers guests privacy and seclusion without isolation. Erakor Island Resort also features a Spa centre, restaurant overhanging the lagoon and bungalows with waterfront location. 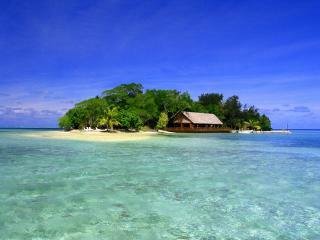 Eratap Beach Resort is a small, exclusive resort located less than 20 minutes drive south east of Port Vila. Swim off the jetty in the turquoise lagoon, snorkel for giant star fish or organise to be dropped off on a deserted island, the choices of activities are endless. This boutique resort caters for guests seeking a private, high quality resort with personal service in a beautifully preserved natural environment making this the perfect location for your next holiday to Vanuatu. 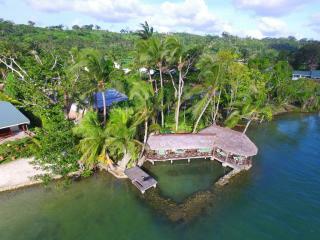 Fatumaru Lodge is an intimate and boutique waterfront Vanuatu experience whilst still being close to the city centre. Only 10 minutes from central Port Vila, Fatumaru Lodge provides the convenience of being close to restaurants, shops and attractions whilst tucked away in a quiet location. Fatumaru Lodge offers Seafront Studios and 2 Bedroom Seaview Family Units with all accommodations inclusive of fully equipped kitchens. On site facilities include swimming pool, jacuzzi, direct access to white sandy beach and lodge jetty. 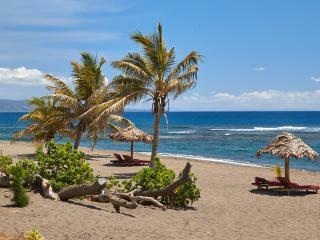 Friendly Beach is located just 6 kilometres from Mt Yasur Volcano on Tanna Island. This Vanuatu accommodation offers a remote and secluded beachfront location that is also close to many other attractions that Tanna Island has to offer such as the John Frum Cult village, hot mineral springs and Port Resolution. The accommodation at Friendly Beach is basic but offers a comfortable nights sleep, the rooms offer a veranda, hammock and mosquito nets and are traditional Melanesian Bungalows. If you enjoy lazing on the beach in the sun or spending time in the ocean whether it be swimming, snorkelling or diving then Hideaway Island Resort is the ideal holiday destination for you. A variety of accommodation choices are available at Hideaway Island Resort from basic dorm rooms up to a modern and spacious 2 bedroom villa with private pool. 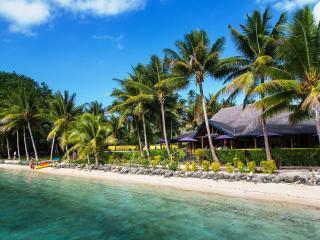 This Vanuatu accommodation is easily accessible by bus and a short boat ride from the mainland. 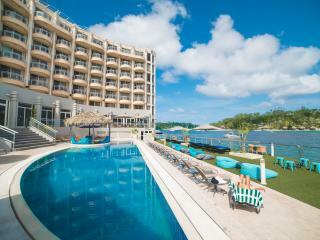 Holiday Inn Resort Vanuatu is Vanuatu's premier international deluxe resort. This low rise resort is set on 60 lush landscaped acres with a private beach frontage overlooking the tranquil waters of Erakor Lagoon. Features include a nine hole golf course, floodlit tennis courts and a children's "Penguin Village". 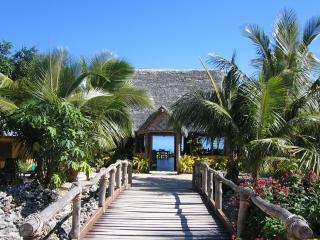 The resort has 148 guest rooms featuring local arts and materials with a relaxed and friendly Melanesian atmosphere. There are also 10 Villas offering unrivalled seclusion and luxury, and linked to the main resort by a 160 metre suspension bridge. This Vanuatu accommodation is set in the main bay of Port Vila, with its easy access to the mainland Iririki Island Resort is perfect for couples and families to begin their island escape not long after landing into Port Vila. A wide range of facilities are available to enjoy including water sports, restaurants & bars, activities, swimming pools, day spa, kids club plus much more. Relax by one of the swimming pools, indulge at the day spa, create memories with your partner for family that will last a lifetime. 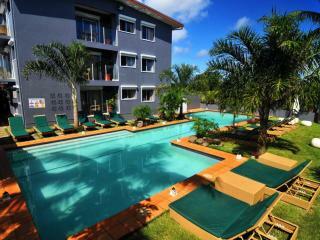 This Vanuatu accommodation offers an affordable choice for business or leisure travellers. Kaiviti Motel is set a short distance from from the airport and downtown Port Vila. The motel features a range of studio and apartment style accommodation with kitchenette or kitchen facilities making them ideal for extended stays in Port Vila. 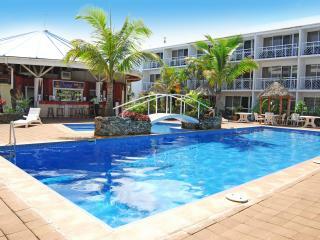 Kaiviti Motel also features a number of on site facilities including a BBQ area swimming pool, parking, laundry and more. This Vanuatu accommodation is situated on a ridge close to the centre of the Port Vila township, with truly magnificent views across the tranquil waters of the Erakor lagoon. The "exclusive adults" Mangoes Resort & Restaurant is a peaceful tropical escape for couples and individuals to relax and enjoy their Vanuatu experience, away from children. This affordable Vanuatu accommodation is set overlooking Port Vila Harbour offering modern rooms that overlook the gardens, harbour or swimming pool. Mooring Hotel offers a boutique feel with a total of 30 rooms guests will enjoy a personalised experience. Guests can enjoy the use of the onsite facilities including swimming pool, restaurant and bar. Moorings Hotel is perfect for couples or for small families. Pandanus Bay Waterfront Apartments is the ideal choice for a self catering holiday to Port Vila Vanuatu offering a waterfront location and tropical gardens. The luxurious apartments are modern and spacious featuring full kitchen facilities and air conditioning. The apartments are located a short 10 minute drive from the main town of Port Vila and also close to many tourist locations such as the Mele Cascades. 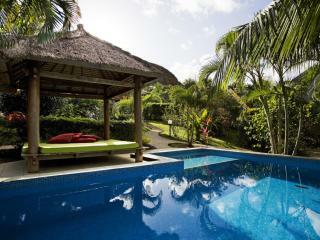 This Vanuatu accommodation is a great choice for small to large families, couples or groups. Paradise Cove Resort is a small boutique hotel located at Pango Point, approximately 15 minutes south of Port Vila town. 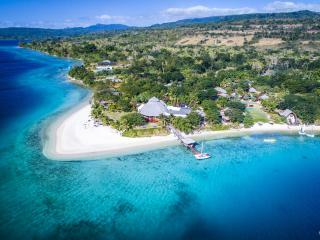 With only 10 villas, Paradise Cove Resort has a maximum occupancy of 30 guests which ensures a very personal, flexible Vanuatu holiday atmosphere. Swim or snorkel at the private beach, relax in your hammock, hire a bike and meet the local people at the nearby village, or sip a tropical cocktail while watching the sunset over the bay. This Vanuatu accommodation is perfect for couples and families after a relaxing holiday in Vanuatu. Poppy's on the Lagoon is set directly on the water's edge of Erakor Lagoon which provides the perfect spot for safe swimming and water sports. The studios and bungalows offer basic kitchen facilities making all rooms ideal for those who enjoy self catering, fresh produce is available 15 minutes walk in down town Port Vila. 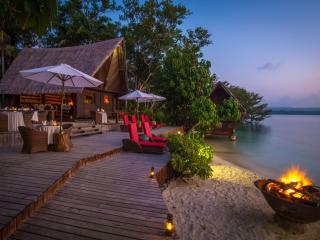 Ratua Island Resort & Spa is a private and luxury property located off the coast of Espiritu Santo in Vanuatu. This Vanuatu accommodation has been created using 200 year old villas from Indonesia which creates a rustic yet luxurious feel to the rooms. Each room offers a beach front location just steps away from the waters edge. The island itself is easy to explore with the use of a golf buggy, mountain bikes, horses or by foot. If you're after a relaxing and private holiday then Ratua Island Resort & Spa is for you. This Vanuatu accommodation is a great choice amongst couples. Enjoy relaxed days on your balcony, laze by the swimming pool or explore the lagoon on your choice of watercraft. 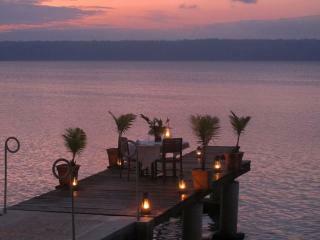 Sunset Bungalows Resort offers an intimate setting with a maximum of 38 guests at any one time. For your next holiday to Vanuatu as a couple why not consider Sunset Bungalows Resort. This Vanuatu accommodation boasts breathtaking views over a stunning white beach and out across the Pacific Ocean. Tamanu On The Beach is relaxing Vanuatu beachfront accommodation. Guests will feel as though the beach is their own with over 500 metres of white sand to explore. Relax poolside, enjoy fresh meals at the restaurant and spend some time exploring the local area. 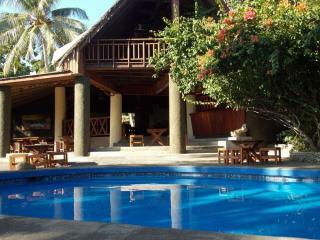 Tanna Lodge is set on a volcanic sand beach 20 minutes' drive from Tanna White Grass Airport on Tanna Island. This Vanuatu accommodation offers Western comforts such as Wifi Internet and 24 hour mains electricity which is unique to other resorts set on Tanna Island. Tanna Lodge is perfect for those after a comfortable night sleep before or after heading out to visit the famous Yasur Volcano. The Lodge features a swimming pool, restaurant and bar along with 15 spacious Villas and rooms with beautiful views of the gardens and ocean. Overlooking Vila Harbour, The Grand Hotel & Casino boasts a stunning waterfront position and extensive water views from every guestroom. Ideal for the business or leisure traveller, this contemporary hotel is conveniently located close to the shops, restaurants and local markets of Port Vila. The Grand Hotel & Casino features facilities such as a swimming pool that over looks the harbour and an elegant Casino. The Havannah Vanuatu offers a luxurious location for those travelling to Vanuatu, with scenic ocean views and modern amenities this Vanuatu accommodation is perfect for a romantic holiday or a place to relax and unwind. The Havannah Vanuatu is Vanuatu's newest luxury accommodation, featuring plunge pools, an overwater villa, restaurant, bar and many activities to choose from. The rooms are well appointed to take in the tropical setting, ocean views and to catch a glimpse of the beautiful sunsets. The central location and excellent facilities at The Melanesian Port Vila cater for all travellers, from the casual holiday maker to the business executive. Only 7 minutes walk from the Post office, The Melanesian Port Vila offers a wide range of accommodation styles from self catering two bedroom family units to superbly appointed Rooms and Suites. There's a gaming lounge, restaurant, two bars, swimming pool and tennis courts and a collection of crafts and artefacts throughout the hotel that rivals the Museum! Located on a hilltop above Erakor lagoon, The Terraces Boutique Apartments offer modern self contained apartment accommodation in a beautiful tropical setting. Suitable for couples or families with older children The Terraces Boutique Apartments are the ideal destination for your next Vanuatu holiday, whether it be a romantic retreat or adventurous island getaway. The Tropicana Lagoon Apartments are only 5 minutes from downtown Port Vila, and are situated in beautiful landscaped tropical gardens with 60 meters of white sandy beach frontage and easy access to the lagoon for snorkelling and fishing. This Vanuatu accommodation offers guests modern, spacious, fully self-contained studio apartments with direct beach access. There's a beautiful deck built over the lagoon which is a lovely shady place in the daytime and just the perfect spot for watching the sun go down. Here you can have a BBQ or just enjoy a couple of drinks from the beach bar. Other facilities include a tour desk, swimming pool and a free shuttle service to town. Turtle Bay Lodge is located on the island of Espiritu Santo. The lodge offers a stunning beachfront location that faces the blue waters of Turtle Bay. 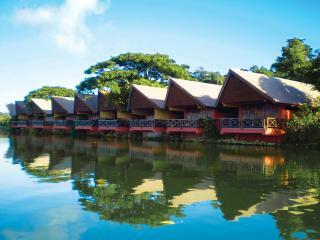 This Vanuatu accommodation features a range of rooms as well as a swimming pool and restaurant. 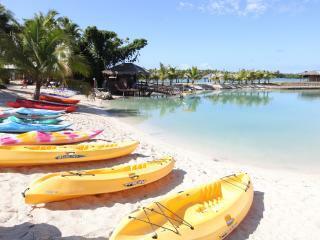 Spend some time relaxing, swimming, snorkelling, diving or canoeing over the clear blue waters. Turtle Bay Lodge is ideal for couples or families that want to get away from a busy lifestyle. 'Vila Chaumieres' is French for 'charming cottages'. It's an ideal location for lovers of fine food and wines looking for an island holiday away from the larger resorts. There are four comfortably furnished apartments with tropical peaceful garden setting and two rooms with spacious balconies overlooking the lagoon. All are air-conditioned with overhead fans, ensuites and a refrigerator. Vila Chaumieres caters only for adults and makes for the perfect tranquil, relaxed and romantic escape. Village de Santo Resort is the perfect location for those after a self catering property on Espiritu Santo. 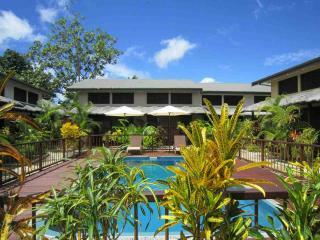 This Vanuatu accommodation features 18 semi self catered apartments ideal for families, couples or a group of friends. The rooms are modern and over look the properties swimming pool and close to the onsite restaurant and bar. Facilities at Village de Santo Resort include a restaurant, bar, swimming pool, WiFi internet and secure divers wash down area. This Vanuatu accommodation offers the perfect location for a fun family holiday or romantic getaway for couples. 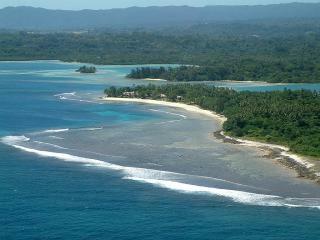 Warwick Le Lagon Vanuatu, Vanuatu is set on 75 acres of tropical gardens and fronts onto the Erakor Lagoon. Guests can enjoy the numerous facilities and activities available, for the Kids they can enjoy the complimentary kids club throughout the day while the adults relax by the swimming pool or have a beach massage. If you are looking for a resort in the South Pacific then the Warwick Le Lagon Vanuatu will have a room suited to your needs. 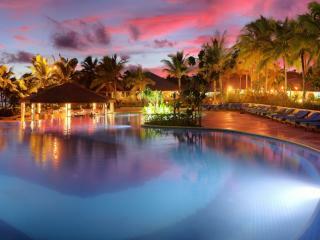 White Grass Ocean Resort is an ideal starting point from which to explore Tanna Island. The Resort is situated only minutes from the Tanna Island airport, with 14 Melanesian style Bures overlooking the Pacific Ocean. Set amongst 6 acres of beautifully landscaped gardens, the resort has many activities on site and offers virgin reef snorkelling, sea kayak safaris, mountain bikes and many 4wd safari tours including Mt Yasur Volcano, custom villages and underwater caves. White Grass Ocean Resort is the perfect choice for guests wanting to experience the culture and natural beauty that only Vanuatu can offer.